Amor Chamoy is a versatile sauce that infuses the tang of citrus with the smoothness of dried chili peppers. Sprinkle some �love� (Amor Chamoy) on popcorn or peanuts for a mouthwatering snack, or use it as a distinctive fruit salad dressing or a savory marinade. It�s the perfect sauce for grilling! Amor Chamoy (Chamoy Love) by Castillo is a sweet, sour and tangy fruit sauce that you can add on to your favorite snacks, like fruits, vegetables, potato chips, peanuts, popcorn, slushies and beverages. Its authentic flavor is a great alternative to spicy sauces since Chamoy Sauce is mild and is more sour and fruity than spicy. Amor Chamoy has a great flavor you won't resist. Manufactured by Castillo. Ingredients: Water, salt, citric acid, modified starch, dried chili peppers, acetic acid, xanthan gum, flavoring extracts, potassium sorbate and sodium benzoate as preservatives and FD&C red No. 40. Salsa para Chamoys - Chamois marca AmorLa Salsa para Chamoys Amor de la marca Castillo es una deliciosa salsa para frutas que es agridulce y picosita. Puedes anadir esta deliciosa salsa en todas tus botanas favoritas como frutas, verduras, papitas fritas, cacahuates, pepitas, aceitunas, palomitas, raspados y bebidas. Su autentico sabor es una gran alternativa para las salsas picantes ya que el picor de la salsa de chamoy es leve, es mas agridulce y frutal que picoso. 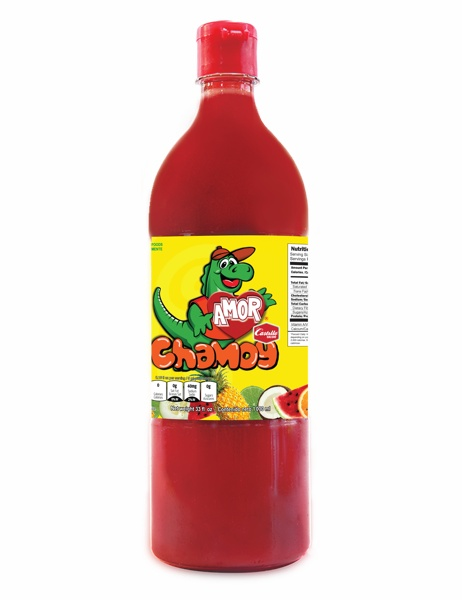 Amor Chamoy tiene un gran sabor que no podras resistir. Fabricado por Castillo. Ingredientes: agua, sal, almidon modificado, acido citrico, chiles secos, acido acetico, goma de xantano, saborizantes, sorbato de potasio y benzoato de sodio como conservadores y color rojo FD&C No. 40.